Stacey Sager has the latest on the Long Island student charged with drawing swastikas. GARDEN CITY, Long Island (WABC) -- The Long Island student accused of drawing more than 100 swastikas on and near his college campus made his first court appearance Wednesday. The judge set bail for Jasskirat Saini, 20, of Plainview, at $60,000 -- $5,000 for each count of aggravated harassment he's facing. Police said Saini is responsible for drawing swastikas at various locations on the campus of Nassau Community College. The incidents started in a men's bathroom on October 15, and escalated to dozens more locations around campus up until his arrest -- when when he was caught red-handed. 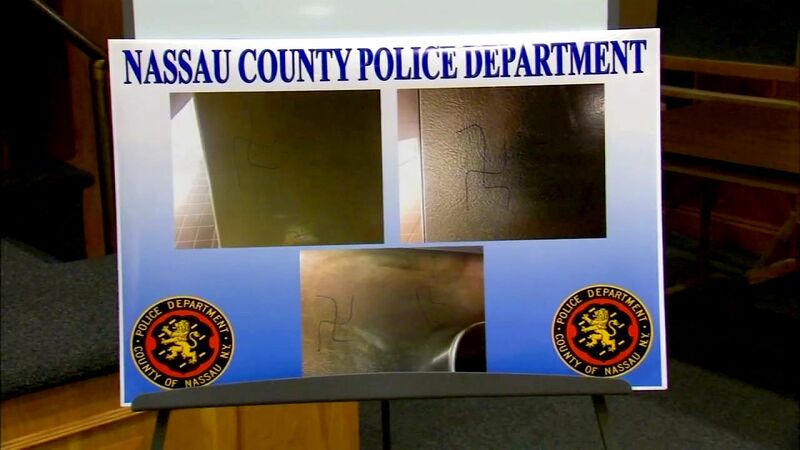 On Tuesday, Nassau County police said they found Saini drawing two swastikas on the exterior wall of Building H, and a KKK on the floor of F Building Cluster 225 at the school. In all, police said Saini was behind 110 different anti-Semitic drawings. Ten of those were on the campus. During his arraignment hearing in Hempstead Wednesday, the judge said that given the polarization in the world right now, what Saini allegedly did was like putting a match to gasoline. "It appears that this bigot was motivated by perceived slights of the Jewish community in his neighborhood in Plainview," Nassau Acting Police Commissioner Thomas Krumpter said. But Saini's lawyer said the charges aren't telling the full story. "He is a terrific young man who is a very family-oriented kid," Attorney Mitch Hirsh said. "We'll determine what this was all about and what his mindset was. He's not an evil kid." Saini's father was at the courthouse Wednesday morning, and had no comment for reporters. Eyewitness News has learned he works for the U.S. military in a sensitive role involving health services. If convicted, Saini could face 48 years in prison. His next court appearance is scheduled for Friday. Krumpter said in 2016, there have been 57 bias incidents in Nassau County; 40 of those involved graffiti. Police said Saini is responsible for more than 10 of those incidents. Bias crimes in 2016 are down 6 percent, he said, over 2015.